The movie opens on a dark night as men pile money from a bank vault into a red satchel while a nervous woman waits in a car outside. As the three robbers emerge from the bank they toss the bag into her car. As she drives off, a guard sounds the alarm; he is shot and the three men flee—but are soon surrounded by the police and forced to surrender (so far, so good, Bombay police!). The trio’s leader Himmat (Sunil Dutt) is already known to the police, as is his girlfriend Kamini; the police search Kamini’s house for the missing money, but find nothing. The next morning the three robbers break out of Central Jail, fleeing on foot, and word goes out to nearby police headquarters. On the road, the three escapees stop a driver (Jankidas) and steal his car. Soon after that, they take the clothes from three men to replace their prison outfits. 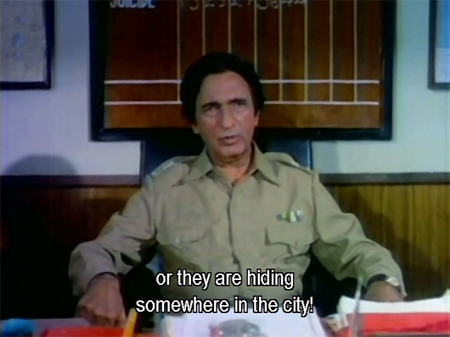 Meanwhile, Jankidas makes his way to the nearest police station, where he tells Inspector Wadekar (Ramesh Deo) what has happened. Wadekar puts two and two together, and Jankidas confirms. 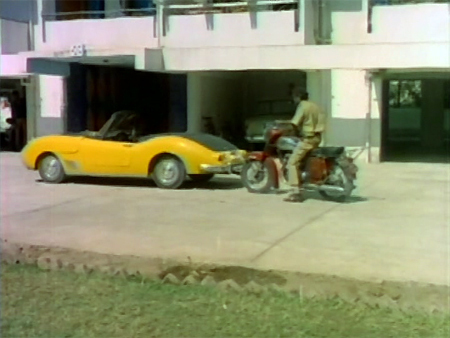 Given the license plate number and description of the car, Wadekar sets up police barricades on the roads going out of Bombay. Thwarted by one such roadblock, Himmat and his two cohorts Ajit (Ranjeet) and Dilawar Khan (a totally OTT Danny Denzongpa) pull off into a quiet neighborhood to rethink their strategy and find a place to hole up while they figure out what to do next. This “fine” house is occupied by a good family; we know that because they are doing their morning prayers when we meet them, with a lovely bhajan called “Rakhiyo Nazar Shri Ram” (music is by Sapan Chakravorty and lyrics by the eminent Sahir Ludhianvi). and they have a little boy named Raju (Master Alankar). Ashok’s younger as-yet-unmarried sister Naina (a very young and nervous Parveen Babi) lives with them too. While Ajit scouts the premises I notice that servants are apparently not part of the household and I like Deepa right away for having windows as dirty (or dirtier! really!) than mine. Thus it is that after the family all go off on their daily routines—Raja to school, Naina out with boyfriend Vijay (Vijay Arora) and Ashok to the office—Deepa is left alone in the house. Poor, poor, Deepa! This is just what our miscreants have been waiting for. 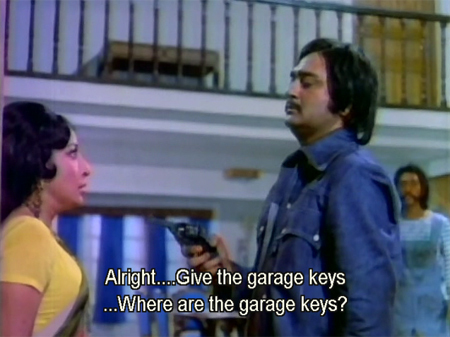 They park Jankidas’ stolen car in the garage to hide it and settle in with Deepa, who is pleasingly if stupidly rebellious and uncooperative and even tries to use Ashok’s hidden pistol to get them out (but sadly they take it from her). By now word has spread via radio about the three dangerous convicts, and Ashok calls to warn her to keep the door locked and not open it to strangers. Too late! Himmat now calls girlfriend Kamini. He asks her to bring the satchel of money from the bank robbery to Bombay, and to call him at the Roy’s house when she gets there so that they can arrange to meet. Police Inspector Wadekar reports in to the Commissioner (1930s singing star Surendra Nath—Mehboob Khan’s go-to hero in that era). 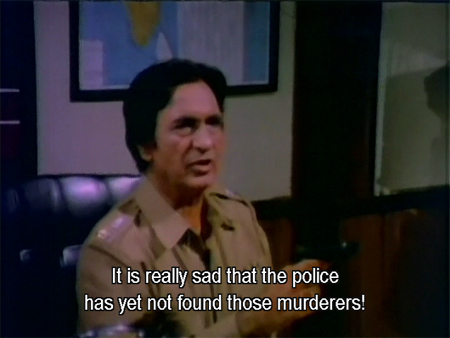 Wadekar tells the Commissioner that the convicts have somehow escaped the dragnet on the roads. He then proceeds to tell the Commissioner that the escapees will surely try to contact Himmat’s girlfriend Kamini in Pune. The Commissioner is obviously exasperated at this piece of news and orders Wadekar to get the Poona police to tap her phone (too late!) and to set up a watch on her house, which of course they should have done already. The Pune police, led by Inspector Mathur (Jagdish Raj) have already searched Kamini’s house for the loot, but have been unaware that her cohorts had earlier escaped. I roll my eyes at the lack of communication and general incompetence. Kamini sets off for Bombay in a sporty little yellow car and a very mod outfit (after retrieving her bag from a hotel room ceiling). Mathur and his men follow her, but lose her after she almost hits a vegetable vendor and an out-of-the-loop traffic cop sets off after her. The last thing Kamini wants is to be pulled over, of course, so she pulls into an apartment complex, parks her car there and disappears. It doesn’t occur to Mathur and his men when they show up minutes later that Kamini might be observing them from inside. She is, of course, and quickly realizes that she’s being trailed for more than just a traffic violation. At the Roy house, Deepa is getting to know the three men holding her hostage a little better. Himmat is definitely in charge, and he has some basic decency. He won’t allow crazy “beast” Dilawar to abuse her hospitality, for instance. Dilawar himself is a weird character—Danny clearly had some fun creating him, but it doesn’t really work. His appearance is Planet of the Apes (neck up) meets Godspell (neck down), and I think his crazed giggle and volatile childishness is supposed to instil fear—but it just annoys me. They are all tense, and it only gets worse as the family members currently outside the house go happily about their lives. Naina’s boyfriend Vijay calls Deepa to let her know that his parents will be visiting later in the evening to formally fix their wedding. 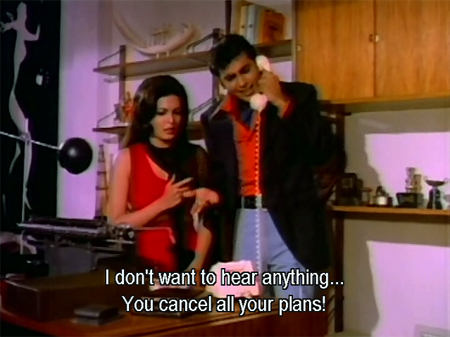 Deepa tries to dissuade Vijay from sending his parents THAT evening, but he doesn’t listen. Not so easy for Deepa to do, since her “plans” are holding a gun to her head. 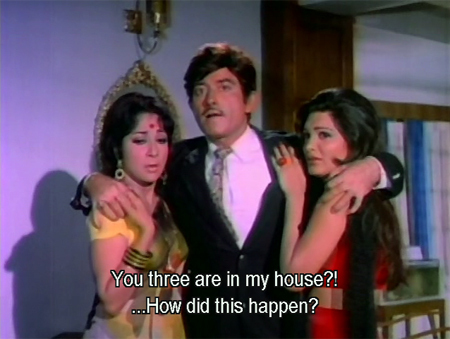 Shortly afterwards, Vijay drops Naina at home. She comes in and Himmat—who is now having tea—introduces himself as “Himmat Chacha” and offers her a sandwich while Deepa looks on, frozen. Naina’s blissful ignorance is short-lived, however, when she switches on the television and is confronted by a news bulletin. 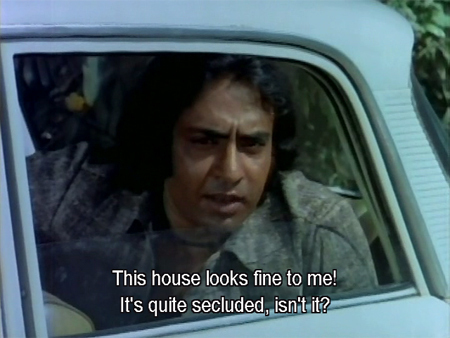 Ashok arrives home next and is puzzled and irritated when he can’t open the garage door to put his car away. 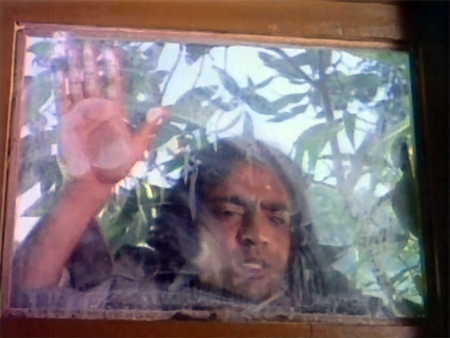 He is sweetly horrified to discover that poor Deepa has been alone with three armed convicts since shortly after he left that morning, and when Raju comes home and is clearly scared by the strangers in his home, Ashok makes Himmat an offer: he’ll give them the money that Kamini is bringing if they promise to just leave immediately. Ashok persists, saying that he will take out a loan. Himmat’s response to this is delusional, and unfortunately probably completely free of any intentional irony. Really? You don’t live on freebies, Himmat? Stealing other people’s money isn’t…getting it for free? If killing people who are in your way is hard work, then okay: I guess you work hard. But “earning” a living is stretching it a bit. I roll my eyes again (it’s happening more and more often). The evening begins (I’ve forgotten to count the hours) and everyone waits for Kamini’s call. Dilawar gets drunk (on Ashok’s Scotch—freebie alert!) and Himmat sends the restless family upstairs to their rooms (this also makes me laugh: how paternal of him!). Things are about to get complicated, though, as the outside world intrudes. Naina has plans to go to a party with Vijay, and Vijay’s parents are on their way to see Deepa and Ashok and fix their son’s wedding with Naina. 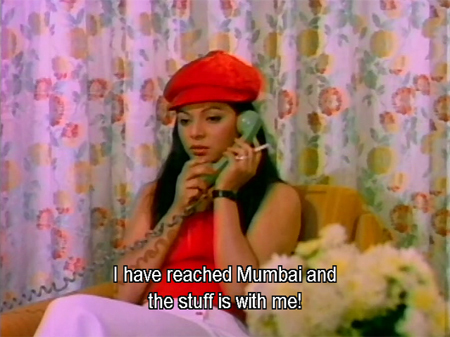 Plus Kamini finally calls. She is stuck in Pune, with the police still watching her car and isn’t going to make it to Bombay by midnight. When night turns into day again, too, Raju will be expected at school and Ashok at work. What do the remaining hours in this situation hold for everyone involved? 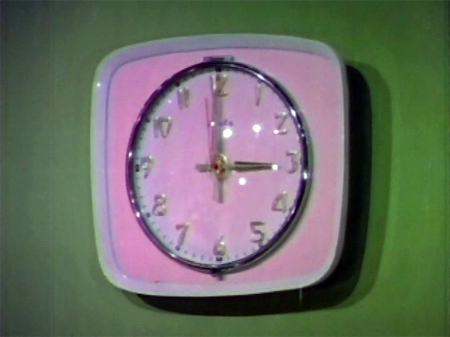 The plot threads become more and more complicated as the clock ticks away. 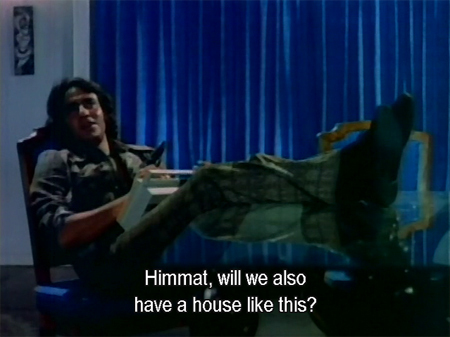 There are many things which are well done and interesting: Himmat’s psychological battle with Ashok Roy (Sunil Dutt and Raaj Kumar have some good material to work with and take advantage of it); the different ways in which each family member deals with the stress; and the hardship individuals allowed to venture out of the house face, unable to ask for help, knowing that loved ones behind are still held hostage. 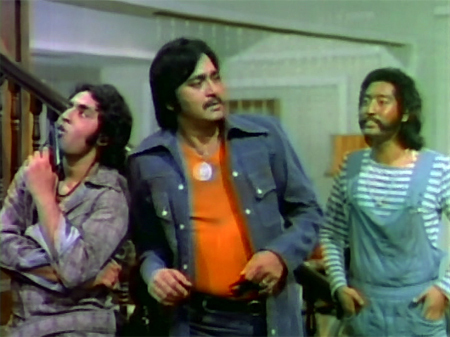 The seventies style is groovilicious too: Ranjeet-Mala-Parveen’s outfits; Sunil Dutt’s shaggy hair; Sonia Sahni’s everything. I had thought that particular color combination was invented by preppies in the eighties, but of course the Indians beat them to it! Overall, though, there are problems which I just can’t overlook: besides Dilawar’s ridiculous masala-worthy act (so out of place here), the track which should have added tension and interest by following a parallel police investigation falls flat because of their total incompetence. 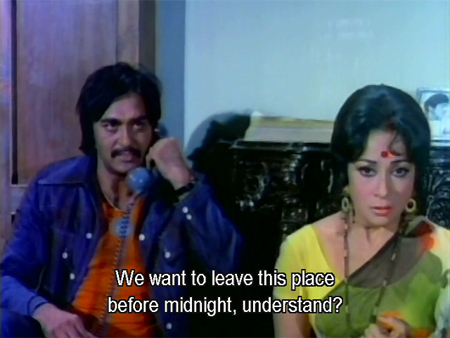 For instance, Wadekar asks Deepa (through a note) at one point to give them a signal if there are intruders in the house—and she gives it. Yay, right? Nope. No follow-up! I feel your pain, Commissioner sahab. Plus I would have liked to see a bit more background on how Himmat and Ajit (I don’t care about Dilawar) ended up being bank robbers and murderers. The lip-service paid to their better instincts and motivations (“we don’t take freebies”) along with a thirty-second look back at their childhood was simply not enough to make me care or be able to contextualize their transgressions, and for the film to succeed for me it was necessary that I should (well, I always care about Ranjeet but that’s another matter altogether). In any case, it is an interesting film worth a watch, even if it’s not completely successful. There are very few songs: the nice bhajan I mention, plus a couple of other fairly unremarkable ones (not Sahir-worthy, in my opinion) and a fairly tawdry musical number. If you want the music—it seems difficult to find!—my pal PC over at Third Floor Music has just posted the soundtrack (after waiting patiently for me to stop babbling on about the movie itself). It’s there along with the much more awesome soundtrack from Kalicharan too. Enjoy! Posted on September 22, 2010 at 3:31 pm in Hindi movies	| RSS feed You can skip to the end and leave a reply. I havent seen this movie in a very long time but from what I remember of it, I enjoyed it tremendously. Maybe because it was a change from what I was used to? I’m thinking about seeing it again now. It is unusual, and there are many things to enjoy! I was just disappointed that it wasn’t as good as it *could* have been and almost was. Memsaab thanks for this review.I am a very big fan of beauty Queen Parveen Babi.Year back I saw this movie on DD,but Yash raj & moser dvd cut one song from movie. I enjoyed Sunil Dutt and Rajkumar’s fight.Sunil Dutt’s cruel eyes and Danny laugh I still remember.Song ”chup ho aaj” by Kishore Da is superb. I got her first two movies (1.) Charitra -vcd (2.) Dhuan ki Lakeer – vhs .There is one more song which Parveen Babi and Vijay sings in garden I got that only in audio. I have always liked movies that are set largely in a house / locality irrespective of their story lines. This is one such movie. Farrar (1975) was another. What I didn’t like was Sunil Dutt playing a negative role though he was good in the movie. Raaj Kumar was good only during the climax when he….well…I don’t want to reveal how it all ended. Maybe Greta can choose to write it as a spoiler in one of her comments. Yes, that scenario can really have a lot of potential—have you seen Anokhi Raat? I loved that one. I don’t mind Sunil in a negative role (I just like good performances and admire those who can play different types)…but I was disappointed that his character was sort of fractured and inconsistent. Bad people have good qualities, and vice versa! but in a story with so few characters and with such intensity it is nice to get a real sense of what motivates them and his was a failure in that regard. I thought though that Raaj Kumar’s character was better sketched out (not blaming Sunil either—it’s more of a script or editing issue I think). 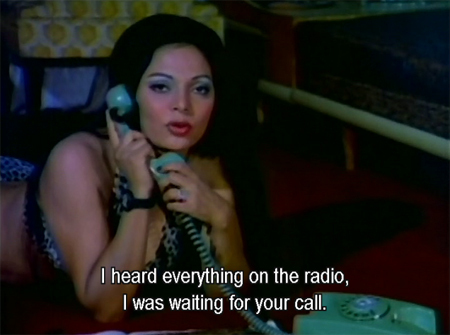 No, i haven’t watched Anokhi Raat yet. Its there in my list now. Another movie that I liked is Ittefaq (1969) which was based in a similar setting. Aitbaar (1984) was another such one. Must add Yaadein(1965) too to the list, not sure if the movie is set in a house though. Yaadein is a first of its kind and is produced and directed Sunil Dutt . The USP is that he’s the only actor in the movie from the beginning to the end. The only thing i have heard of this movie is Parveen Babi and Danny Den starring in it. Never knew that Sunil Dutt and Raaj Kumar were also part of this. I am interested in seeing this movie only for Danny who is a good actor. BTW, parveen babi looks great in that green saree – the necklace and pendant are good too. Thanks for the review memsaab! I love Danny, but he’s pretty bad in this one :) So is Parveen, although she looks pretty (how could she not)…But it’s worth a watch if you want something different! I kind of liked 36 Ghante in parts, now i think that those parts must have come from the Bogart film. I think someone should come out with the background tracks from Khote Sikkey. This track sounds exactly like the track in “Apradh ” when “Fifi-Faryal” is dancing as Mukhri and gang are enjoying the spectacle. That one was by Kalyanji.. The riff of this soundtrack is also used in the song.. “Hamare Siva tumhare aur kitne deewane hain”.. (Besides me how many lovers do you have… ). Apradh is the original. Vinayak—you are SO RIGHT about the background tracks from this. That is true of many films, unfortunately :) And I love this clip you added—Sudhir rocks. Great review Memsaab. I saw this movie when I was barely 10 and it was immensely engaging. A re-watch several years later and I still found it much different from the usual 70s fare. I thought it was a good thing not to explain why Himmat & Co became bad guys, a departure from the days when a leading man (Sunil Dutt)gone bad was justified at every end. 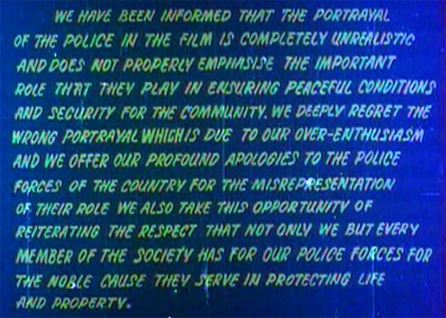 Im willing to forgive the police lapses, and if this movie was to be made today Im sure it would have a sub-plot of a police officer in cohoorts with the crimnals. Both Sunil Dutt, and Raj Kumar were in great form, and I agree Danny was a dissappointment. I remember seeing Danny-Raj Kumar in Bulundi (1980), where Danny played a double role (father son), and Raj Kumar played an upright professor that goes vigilante. Crackalastic masala fare with RK delivering some bombastic dialogues. It is engaging—I was riveted (as much as I ever am with my sadly short attention span). I know what you mean about the “justification” of evil—it is one of those messages delivered pretty often with a hammer, but that’s not really what I wanted…I just wanted to know why Sunil’s character made the choices he did, because they were contradictory. I wouldn’t have necessarily found him more sympathetic and didn’t need to but he came off as a badly written character when he could have been a well-written one with a bit more effort. Even just a few more lines of dialogue with Kamini, or Ajit, could have made a big difference I think. Thanks Ankit about Bulandi. I will have to watch that. Seems like a fun movie. 36 Ghante, I had nearly forgotten this! Funny enough, I can remember only the scenes of Raaj Kumar-Mala Sinha ched-chaad. Sunil Dutt was taking at this time all kinds of roles to pay back the loans taken for Reshma aur Shera. Luckily we will never have to find out :) thanks! Reshma aur Shera is a really good movie, have to give ita dekho! Moved me every time I saw it! Saw this film long, long ago. Yes you are right Danny did overact. It was the usual Hindi film but as we say here in Bombay ‘A time-pass movie’. Just see it, enjoy it, grumble a bit at the scenes you find ridiculous and forget about it as soon as you walk out of the cinema hall. 1) Liked the Sunil Dutt-Raaj Kumar tussle more than the Bogart-Fredrick March. 2) Overall, I think Bogart was better. 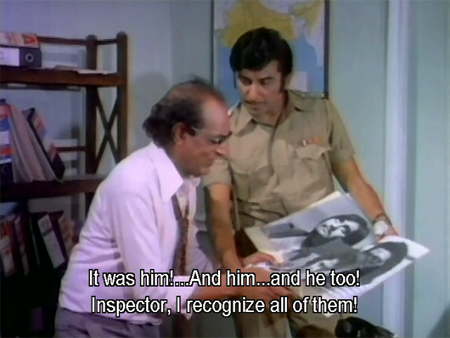 3) Incompetent Indian Police was the norm of the 70’s Bollywood (unless a major Hero was playing a Police Inspector.). Hence if you overlook this deficiency, 36 Ghante was not such a bad adaptation. And yes, Sunil and Raaj Kumar were not even orphaned childhood friends who grew up on the opposite sides of the law :( No masala. 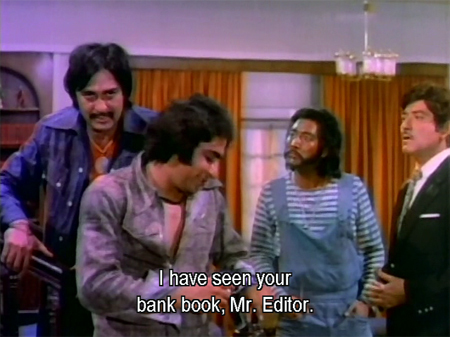 Oh, boo – I would hope that any film with extended bits of Ranjeet (!) and Danny would be amazing… alas. Maybe it’s the Raaj Kumar factor. He’s right down there with Pradeep Kumar among my least favorite heroes. Ha ha! It’s not amazing but you might like it—it’s certainly different, and there are lots of good things about it. You know, Pradeep is fast becoming a fave. He just was so willing to participate in ridiculous films (I don’t mean unintentionally ridiculous, I mean the so-called “B” movies of the sixties and seventies) and really has fun with them. There are other actors whom I will likely never love, but I gotta say Pradeep has overcome my prejudice against him. I also love his blue eyeshadow, but that’s another story for another day. 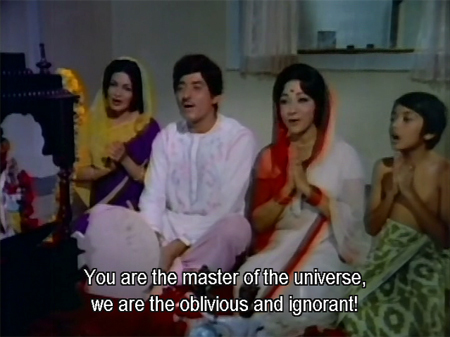 Raaj Kumar has something that compels me towards him, although I am often repelled in equal measure. Virginia thinks he has special pheromones and I agree :) Hmmm. He loves makeup too, come to think of it. i love the song jane aaj kya hua – kishore asha duet the most. I did enjoy watching the movie….it was nice to see sunil dutt, danny,raajkumar,mala sinha,parveen babi and sonia sahani..
a good thrilling movie but Ittefaq starring the superstar rajesh khanna released in 1969 is way far ahead of even a gupt of 1996/98. did sonia sahani ever play a positive role in her career or was she relegated to vamp roles? :) He is the most compelling presence in the film, for sure. How did Danny become a big star that time – cannot recall any movie which made him famous. was it ‘Dhund’? he was in demand for Sholay. Sunil Dutt seemed to just go down in his career graph after 1975.
see Shashi Kapoor -similar age – becoming very popular. infact Sunil was a 60’s Hero and only had stereotyped dacoit roles to show in his filmography apart from Reshma aur Shera and few others. Sunil was the villain in ‘Geeta mera naam’ – directed by Sadhana.She even did a cabaret song.and perhaps her last movie role. @Filmbuff – Just a few corrections. Danny’s role was quite significant in Love Story (1981 actually). He played the heroine’s father and was dead against the lead couple getting married, so can’t qualify it as a ‘tiny role’. The song that you mention is from Khotey Sikkay (1976). A dad’s role in hindi films is hardly significant for an actor to display his talent. Of course he was the Dad who was objecting to KG and Vijeta’s love story! I do remember he did very well in this movie. The song ‘sun sun kasam se’ is from the film ‘Kala Sona’ (1975). The film ‘Yeh Gulistan Hamara’ had the song ‘Mera naam aao mere paas aao’ sung by Danny. Good question Chris – I guess Dhund (1973) may have catapulted him to stardom, though there is no that kind of information. If I am right, he first appeared in Mere Apne (1971), but in 1972, I don’t know of any significant roles that he portrayed. So my guess is also that with Dhund, he became a known face. Raaj Kumar is my favourite and was wayy better actor and much more famous than Pradeep Kumar.just can’t compare them. wasn’t he Sunil’s father in a famous movie by Mehboob Khan?. and Waqt also starred them. Yes, Raaj Kumar played Sunil Dutt’s father in Mother India (1957) and elder brother in Waqt (1965). Apparently, Dharmendra was approached to play this role, but he turned it down since he was younger than Sunil Dutt. I think Amitabh’s ‘Faraar’ – 1975 might just be inspired from this movie plus Raj Babbar starrer ‘Andha Yudh’ had a similar story. note that the ‘villain’ has some good reasons for being bad in both movies. Saw the movie at our tube! And I found it quite satisfying fora Hindi movie. Maybe my expectations were very low. But you are right they could have etched out Sunil’s character a bit. He deservedd it. 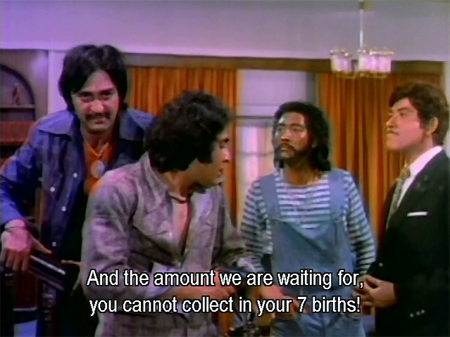 Ranjeet’s role though small had more dimensions to it. And what bit Danny to do that foolish act? He is usually quite nice and reliable. Master Alankar’s character did get on my nerves, but it had a positive side to it, it diverted my attention from Mala’s histrionics. What really surprised me was the number of hats in Raaj Kumar’s wardrobe and he never wears one! Also liked the different point of views presented. What I didn’t like at all was the fact that the only muslim in the film is the most evil one. Not very representative. Master Alankar is one of my favorite kid actors, but he did get on my nerves too in this one. Ah well. I saw this in Strand in Bombay (Colaba). That puts me at 6 years and I enjoyed every detail of the movie… SPOILER ahead.. I almost cried when the family locked themselves only to find the kid had escaped and captured… Vaguely remember a “nice” opening scene with Sonia Sahni… and one of my Aunts commenting how brave I was in seeing this movie… I was giving her a scene by scene narrative of the plot. sorry correction… that puts me at 8 years…sigh in relief. It is a very suspenseful movie, especially when you realize that the police have no idea what they are doing! :) I think I’d remember it pretty vividly if I’d seen it at 8 years old—it def. would have scared me in places then. Vijay Arora is always good in his roles too. Perhaps he was just too good, and the cult of personality won over his ability to just slip into his characters. I remember that Danny and Parveen were involved for some time, then she moved on to Kabir Bedi and he to Kim ;-) I think they were both fairly new (at least they acted like it) at this point in time, but both made definite strides in their work after this. I love seeing them both in the credits, any time! Greta, I highly recommend THE DESPERATE HOURS…it is a wonderful film and is available on DVD. And because THE DESPERATE HOURS is one of my favorites, I must see 36 Ghante…I do love my beautiful Mala Sinha! Scary that someone really did live through it! I think this movie may have been publicised quite a bit when it was released. I clearly remember lots of posters put up all over town at that time (more than for many other movies). It was also promoted on radio as a multi-starrer if I remember right. Overall I liked the movie but I also thought that it could have been much better. Often movies suffer from having a flimsy storyline to work from, this one had a pretty good plot for starters. It is a pity then that it was not taken to a higher level. Probably intended to result in exactly the opposite, Danny’s role served to actually dissipate the intensity of the movie for me. I found Sunil Dutt too rather bland. I liked Parveen – these were early days for her and I think she did a pretty decent job in this role. Raj Kumar and Mala Sinha were ok too. Master Alankar was irritating. I did not know this was similar to a Bogey movie – maybe I now need to watch that one. Would be interesting to see the Bogart movie, for sure, especially since Mike recommends it so highly. @Memsaab – You seemto dislike the greatest actor Raaj Kumar. He was very very good as a father, brother, husband in the movie & the movie was very very realistic. Finding unnecessary faults is not right. 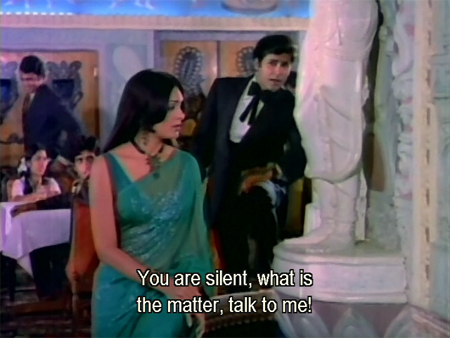 Raaj Kumar as usual outclassed everybody in the movie. 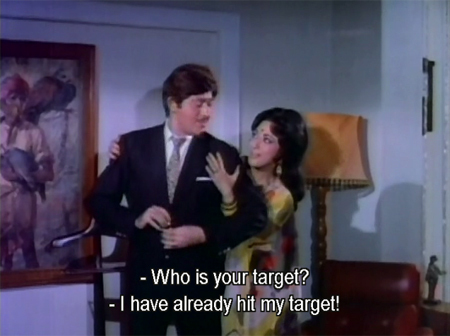 *SIGH* Barry, I do not at all dislike Raaj Kumar but neither do I worship him, blind to his faults. Raaj Kumar did not IN MY OPINION outclass everybody in this movie—you are entitled to think he did, but you cannot tell me that I have to agree with you. I have watched a total of 3 films with Sonia Sahni (thanks to your blog I am able to identify her as being apart from Rehana Sultan(of Chetna fame), Naagin, Chacha Bhatija and this one. In all three she has been shown at least once to be scantily clothed and her roles offer no scope for any sort of histrionics, just askin show. Feel sorry. She looks like she could have carried a strong woman-oriented role on her shoulders.Good-looking too. She was probably I S Johar’s wife. 36 GHANTE was JUNE 1974 release,yes I remember clear cut,I was having my fourth std summer vactions,those days our vacations use to from mid MAY till mid JULY,and everyday use to spent in cinema hall,no surprise as my close/soulmate/more than brother which ITSELF I never Had((SUMAN PURI)from LKG To now had TWO cinema halls those days,so our mission those days use to be,which movie to watch everyday and rest of year SATURDAYS/SUNDAYS which continued uptill our college days(MID EIGHTEES).Back to this movie,an unusual different movie fromB.R.CHOPRA HOUSE),All regulars with this production house,further more than prouction house,(a home to them DUTT uncle,RAAJDA,MALA aunty,Surendernth da,and Manmohan Krishna da,LET me mention here that MANMOHAN KRISHNA DA was favourite with both B.R.CHOPRA camp and YASHRAAJ camp,if you notice ,he was in every movie madeby these production houses till he was in his best of health.New entrants to this house were DANNY uncle,RANJEET uncle,VIJAY ARORA uncle and PARVEEN aunty,who allcame being part of this family.And herby I also remember DANNY uncle once wrote,that to me CHOPRAS and N.N.SIPPYS have always been a family to me.Except for first fifteen minutes the entire movie was shot in one house. 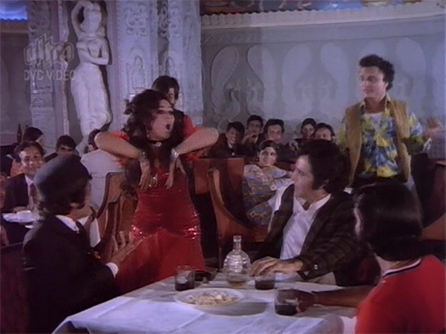 In KANDALA,THREE CHARACTERS(DUTTSAAB,RANJEET/DANNY uncle)on one side and other(RAAJDA,MALA/PARVEEN aunty,and VIJAY uncle on other,Though no justification was given that why the first three mentioned were negative,and rightly so if somebody is wrong he/she maybe wrong without a reason,ALL gave impersive performance,songs were good,though to make the movie more Slicker they would have edited all songs except one which appers right after Interval sang by MUKESH DA/picturerized on MANMOHANDA in sea,though on LP record,they should have had all songs,as they were all good,able support from Ramesh(DEO)uncle,Sonia aunty,and Devan(Verma)uncle was also plus point of movie,a must see movie for those who always believe in watching different,and to think of that RAAJDA,DUTT uncle,PARVEEN aunty and VIJAY uncle are not with us anymore,but this is Law of nature.in fact DANNY uncle had identical getup in PAPPI (FEB.1977)RAVINDER MINHAS,JALANDHAR CITY,PANJAB,minhas35@yahoo.com. i want ti know what about the song jaane aaj kya hua from this film sung by kishore asha…was it nvr picturised???? DEAR SHRIKANT I HOPE YOU ARE FIT/FINE and in best of health,as to of your question regarding the the particular song in this movie,Let me clarify that this song was there in movie when it was released in cinema halls wayback (JUNE 1974),somehow they edited it when it was released on sat. Channels/in fact even in DVD by MOSER BAEER,they too edited it,this was quite soulfull song which even today has remained in my memories,even though its almost fourty years old,since you are quite intersted in cinema of seventees,an era when we grew up,LET me recomend you few movies you might not have seen,DHAMKEE(APRIL 1973 VINOOD KHANNA)CHOKIDAAR (MAY 1973 SANJEEV KUMAR/VINOOD KHANNA/YOGEETA BALI)IMTIHAAN(JUNE 1974 VINOOD KHANNA/TANUJA aunty),INSAAF THE SECOND ONE (MAY 1974 VIJAY ARORA,TANUJA aunty),THE THIRD ONE(WHICH WAS COMEBACK MOVIE OF VINOOD KHANNA uncle after his five year sanyas at ACHARYA RAJNEESH USA MAY 1987)SHATIAN DEC 1973 ANIL DHAWAN/SHATRU/uncle with SHARMILA aunty,SAMJUHTA,(MAY 1973,SHATRU/ANIL DHAWAN/YOGEETA aunty)TANHAAI(I believe should be of somewhere around 1972(ANIL DHAWAN /SHATRU uncle with REHENA SULTAN aunty,hereby IWill tellyou that this trio did about seven/eight movies together ,since most of them were certified with’A’ certificate I Could not watch them,even Today I LOOK out /hunt for DVDs of these movies,and they all were Interesting subjects,and all the above mentioned movies are not there on any sat channel,Like me you too will have to hunt for them.RAVINDER MINHAS,JALANDHAR CITY,PANJAB,minhas35@yahoo.com. Well I became a Sunil Dutt fan after I saw Reshma and Shera and later his come back in Geeta Mera Naam. I went to see 36 Ghante for Sunil Dutt and Danny (I love him). 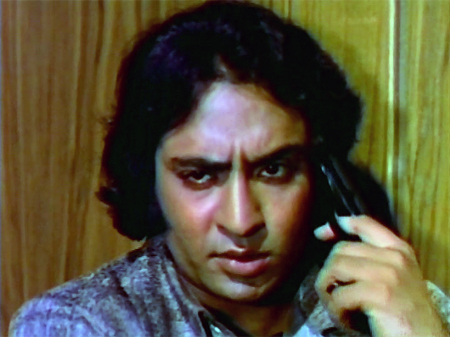 Of course Ranjeet was also there but later I liked him more in Dharmatma and Shatru’s Vishwanath. It was not bad. Memsaab please see and review a film called DARINDA starring Sunil Duttt, Feroz Khan and Parveen Babi. It was quite engaging and I liked it. Music was good.